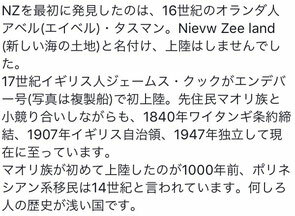 In AC 16th, Dutchman Abel Tasman first discovered New Zealand and named Nievw Zee Land (New Sea Land), but he haven't landed. 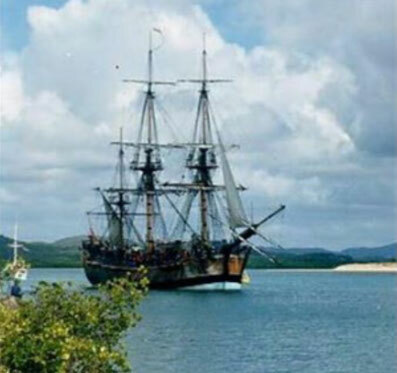 Next man, English James Cook on board his Endeavor (Picture) landed on, and had a small battle with a native Maori, but in 1840, Treaty of Waitangi had been concluded between England and Maori and New Zealand had been England Dominion in 1907, and finally became an independent country in 1947. Maori first landed about 1,000 years ago, and Polynesian immigrants landed at AC 14th. 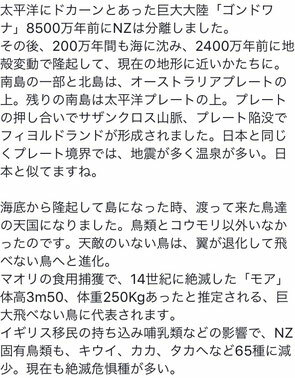 History of New Zealand is short. As you know, the Big Gondwana continent located at Pacific Ocean, had been separated and NZ had been separated also from Gondwana. After this, NZ sank into an ocean about 2 million years and had been raised up at about 24 million years ago by a crustal movement and had been about a same shape of current New Zealand. A little part of the South Island and all of the North Island are on the Australia Plate and the rest of the South Island is on the Pacific Ocean Plate. Pushing by each plate made the Southern Cross Mountains, and a subsidence of Plate made Fjords. There are many earthquakes at a border of each plate and are many hot springs as same as Japan. There were many Heavens in islands for migrant bards due to being no natural enemies, there were only bards and bats. So, many bards degenerated and reduced their wings and not having been flying. 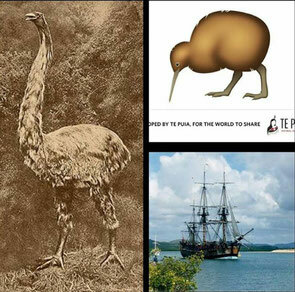 By Maori hunting for their food, MOA, one of biggest birds in the world had extincted in AC 14th which seems Height 3 m 50 cm, Weight 250 kg. It was a popular as a no flying biggest bard. 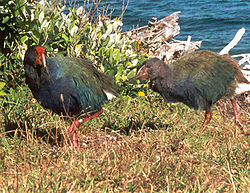 The mammals brought by immigrants from England had been natural enemies for those bards, and NZ origin bards had been to a few 65 species, as the kiwi, the kaka, the takahe, and those are endangered species also. Mountains raised up by crustal movements made many deep valleys and rivers, and flew many mineral components and made fan shaped lands, those made an alluvial plain as the Canterbury great plain. The Grill-Teru restaurant is using Cattle raising in this home ground.